We’re excited to be holding our 8th Annual Fringe Festival this year from 8th -12th August. 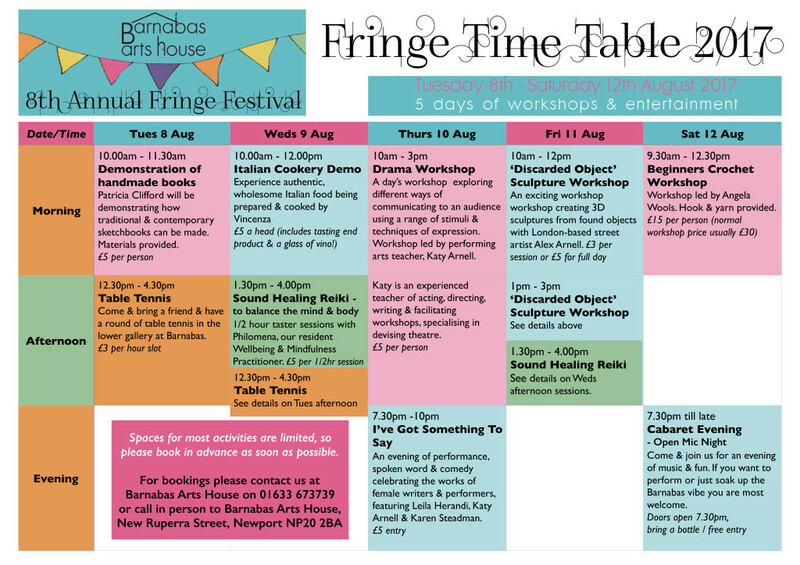 We have 5 days of workshops & entertainment including Italian Cookery Demo, Drama Workshop, Sound Healing Reiki Sessions, Cabaret Evening, ‘Discarded Object’ Sculpture here Workshops & an Evening of Spoken Word, Drama & Comedy. Check out our timetable of events below or see more details in our ‘What’s On’ section, then don’t delay to contact us on 01633 673739 to book your space. We look forward to you joining us celebrating art & creativity at Barnabas Arts House.